Most of us have seen the nail foil pictures floating around the internet, particularly Pinterest. Most of the time they don’t link to anywhere (seriously, that’s a huge pet peeve of mine…), and often the captions will claim that there’s a magical polish that will create this effect. Some say Sephora, some say Essie. 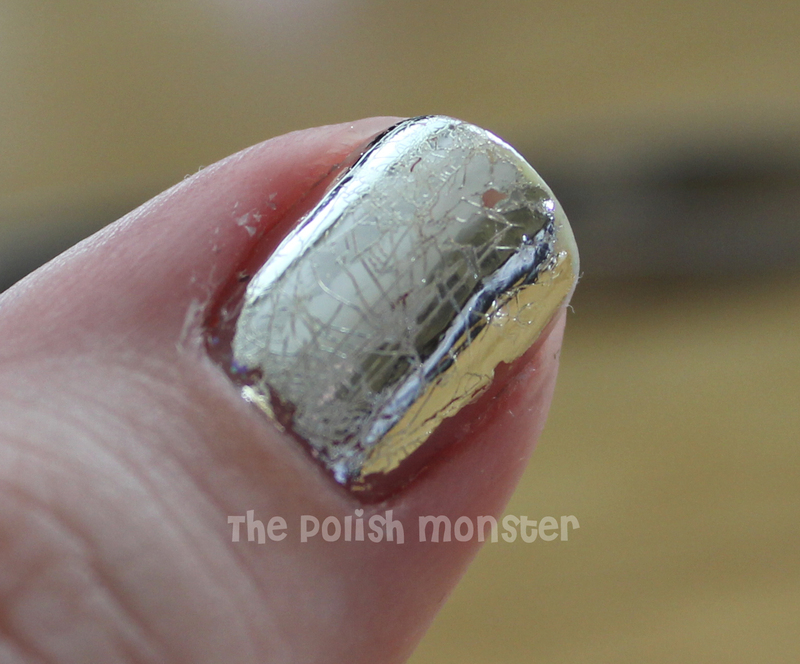 The closest you’ll get in a polish is Layla Mirror Effects… but it’s still not perfect. What IS creating those lovely nails? Nail foil! 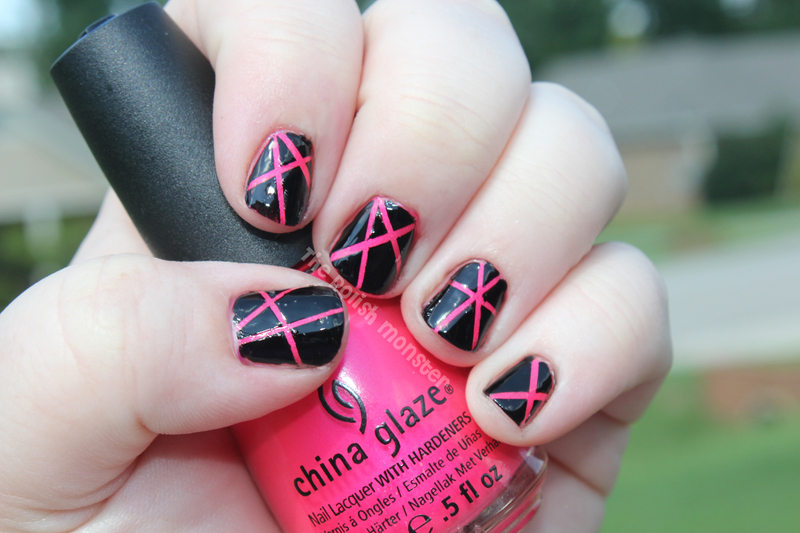 (Or Minx nails/fake nails). 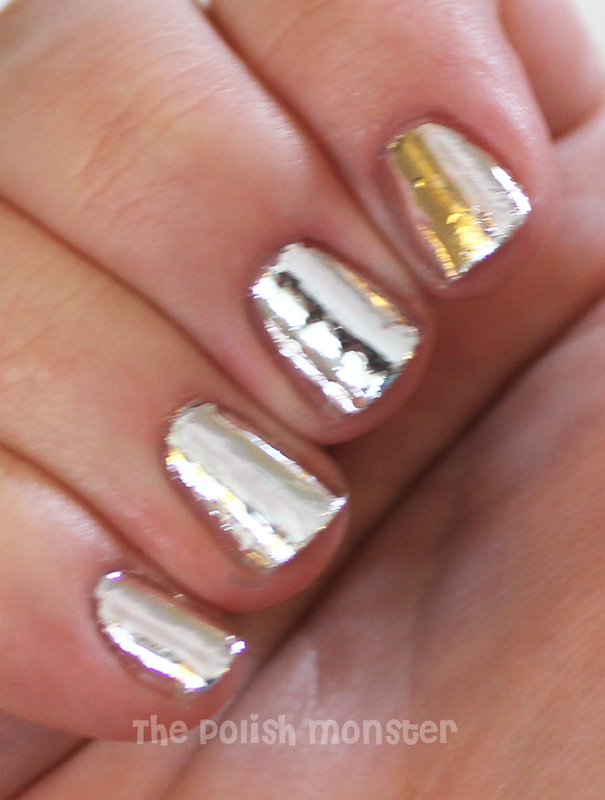 A lot of ladies are familiar with nail foil, but I think just as many have never even heard of it. I didn’t know about it until recently! I bought my foil and glue from Transdesign, but you can also get them from Dollar Nail Art cheaply. Supplies you’ll need: Foil Glue (this is important- it remains sticky after it dries, which is absolutely needed), nail foil, and a Q-tip. I cut the foil into small nail-sized squares. I’m going to go over a brief how-to, but this is the video I used for reference: it’s by Miss80Million and you can find it here. I did these earlier while my husband was at work, so there was no one to take ‘action’ shots. With the video, you can watch her put the foils on from start to finish. Here’s a shot of a nail with a layer of glue, and the one next to it plain. You simply paint a layer of glue on the nail. You don’t want it to be too thick, but you do want it to cover everywhere you’d like the foil. After the glue is completely dry (do not touch it- it will be clear when its dry), place a piece of foil carefully over the nail. Use the Q-tip to carefully smooth it out over the entire nail bed. I won’t lie, my camera took AWFUL photos of these. I’ve never had to photograph something pure metallic, so I’m sure there’s tricks or things I was unaware of. They were a little bumpy- I didn’t take a ton of prep time, and simply laid down a base coat, glue and foil. Much like the metallic polishes, these look a lot nicer on a smooth nail bed. Little blurry shot to show off the effect. The downsides? This was the first time I EVER applied these, and my glue lines weren’t super great so the sides of my nails were wonky and uneven. You also need to be careful- it can be so easily to bump your nail with a sheet before you’re ready, and it WILL adhere instantly. Not good! But overall, these are super cheap, and it’s a really fun mani. They’re not Dollar Nail Art in particular has TONS and TONS of foils- the patterned/holo ones wouldn’t show off every bump and imperfection as much, either! Crackles! This would be a fun look for a ‘broken mirror’ effect, right? One thing I did not buy, and should have, was the foil topcoat. I’ve heard that a non-fast dry topcoat works fine- but I discovered today that I don’t OWN any non fast-dry topcoats. A topcoat of some kind, though, is absolutely needed. All my nails but the thumb (with the fast dry topcoat) remained slightly sticky and were almost instantly messed up. So anyways- try to overlook my not-so-great photos this time- and be sure to try this out! 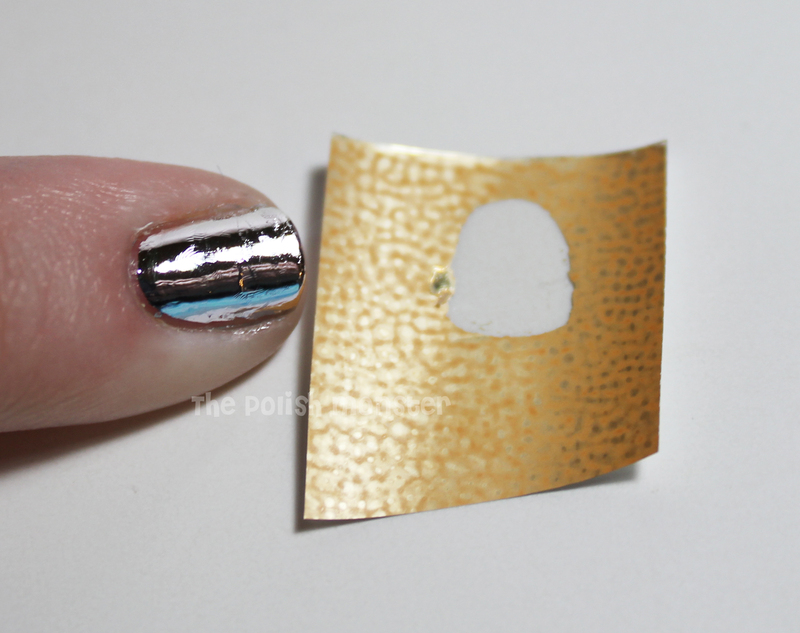 There are some awesome foils to try, and they’re really quick, easy, and CHEAP! Hey all! Sorry for the long break. Things got a little busy here in preparation for school starting! Syd starts back tomorrow and is really excited- I’m sure that feeling won’t last for many more years. So for today, I did something relatively quick and easy. Some of you may have seen my ‘Haul’ post on Facebook that showed a ton of striping tape rolls. I got these for a couple of bucks from China- so while I did wait forever to get them- now I have a lot of options! I’ve seen many, many people demonstrate better than I could how to actually do this mani- but basically, you paint your nails 1 color, and let them dry completely. Place the striping tape over the nail in the places you want, and then paint over the nail (and the tape) in a different color. Remove the tape, voila! A super neat look! 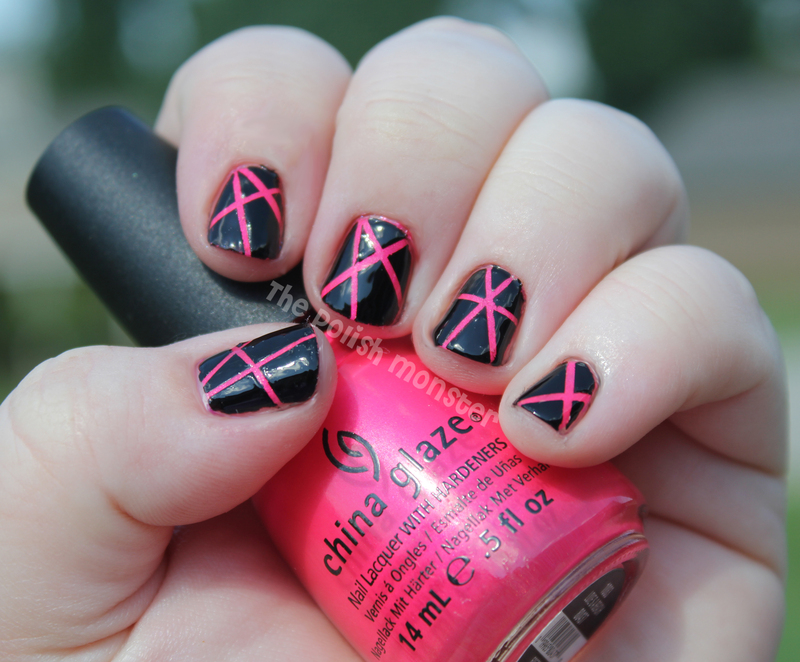 For this I used China Glaze’s Love’s A Beach covered by Cult Nails Nevermore. Love’s A Beach was only 1 coat- on it’s own I’d probably opt for 2, but as a peek-through undie only 1 was needed. So much fun! I didn’t realize at the time that I made 2 A’s right next to each other… I need to pay closer attention when I do this again! 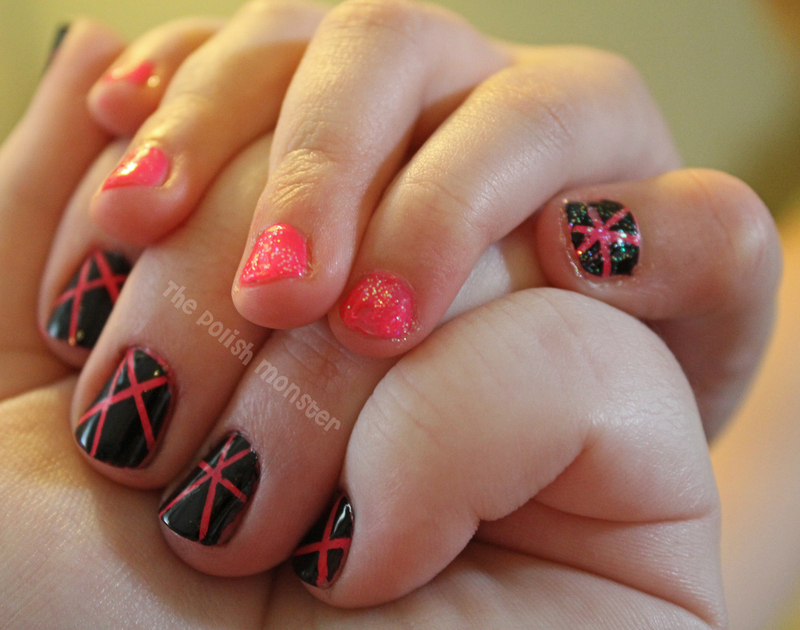 Now she’s all ready for her first day of school tomorrow with some fun nails! And of course, I took a Mommy-and-me shot. I forgot to add- she insisted on a glitter topcoat over hers. 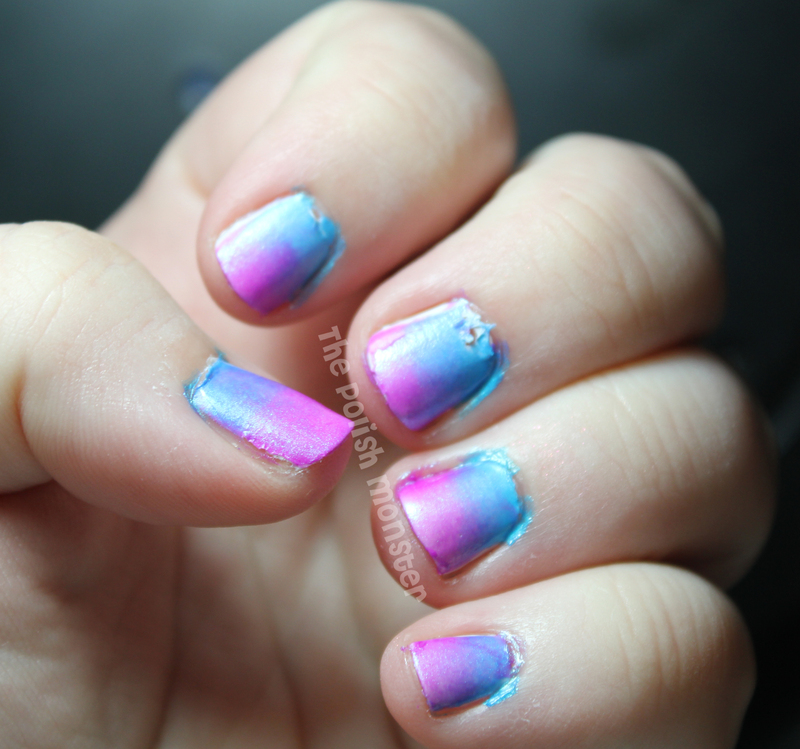 I just have a quick look for you all today- Gradient Glitter! I’m almost embarassed to say I haven’t had a good chance to use any of my Equestria polishes from Rainbow Honey yet. I pre-ordered the full collection, but with SO many polishes and posts, I haven’t had a chance! After watching a few hours of My Little Pony with my daughter this weekend though, I decided that had to change. The subject of my manicure today? Rainbow Dash is the inspiration behind Rainbow Honey’s 20% Cooler. If you’ve ever watched the new version of My Little Pony (Friendship is Magic), you’ll understand why. If not, I’ll provide a video! 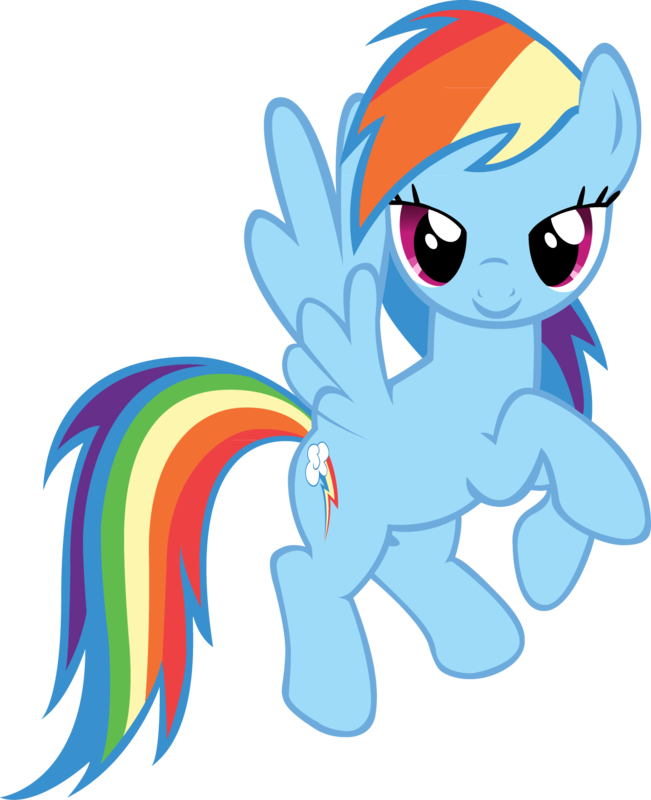 Although not my favorite pony (that’s a tie between Pinkie Pie and Fluttershy), I do love Rainbow Dash. My Little Pony: Friendship is Magic is available for streaming on Netflix. If you’re bored and want to watch something light and entertaining, give it a try! It’s one of the few I enjoy watching with my daughter. Anyways- back to the polish! For this mani, I used 365 Days of Color’s Bora Bora for the base, and Rainbow Honey’s 20% Cooler for the glitter. Bora Bora was the closest blue to Rainbow Dash’s body color that I could find in my stash! The idea behind a glitter gradient is very simple. I put on 2 coats of Bora Bora and covered with a fast drying topcoat. Once it was dry, I did a fairly thin coat of glitter over the entire nail. Once THAT was dry-ish, I added a second coat- starting 1/2 way down and extending to the tip. I let that dry a little, and then dabbed a thick coat on the very tip of the nail. I gave it a few minutes and then smoothed it out backwards towards the cuticle a little to prevent it from having a giant polish bubble on the tips. When I showed my husband, his comment was ‘Uh hon, I think you missed some spots’. So this look isn’t for everyone- and I do think it’s one that looks a bit better on longer nails. Still fun though! And I think these 2 colors look PERFECT together! I’ve heard some reports of people having issues with their Rainbow Honey polishes consistencies. Mine were (are) absolutely perfect and easy to work with. Be on the lookout soon for more of Rainbow Honey’s Equestria Collection- I have GOT to show off those beautiful glitter bombs! You can follow Rainbow Honey on Facebook here, and 365 Days of Color on Facebook here. First off, I’d like to say again- THANK YOU for all the support, and for all the interest in the giveaway! As I mentioned on Facebook, I drew the names of the winners last night, and they have already responded! So big congratulations to Tina, Patricia, and Cayce!! 2 of the 3 winners will have their packages on their way to them tomorrow- the 3rd (at her request) will be getting hers mailed as soon as the Olympics are over. My first international winner! 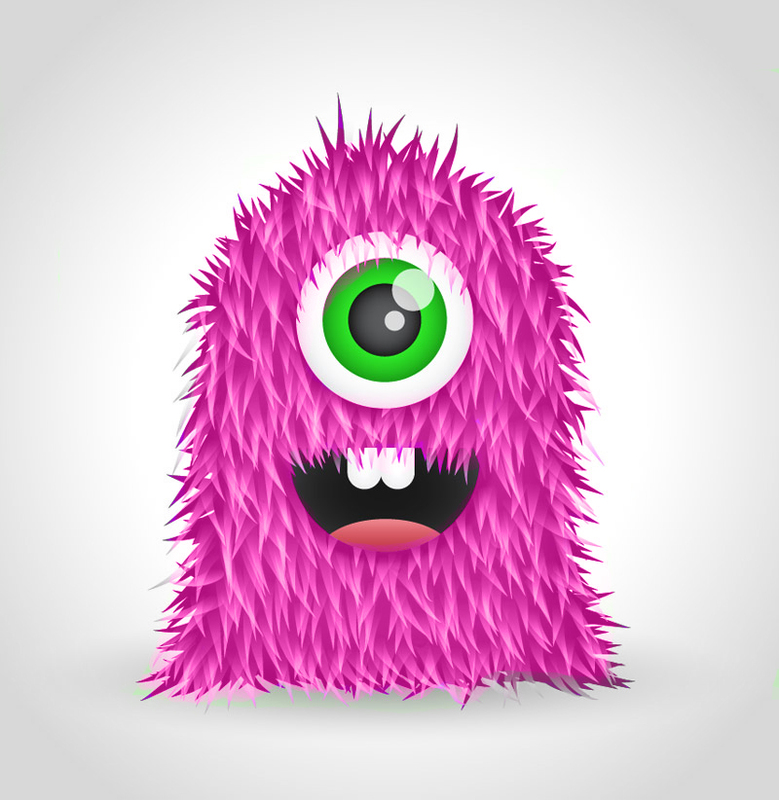 Be sure to post pictures on my wall when you make a fuzzy monster mani, guys! 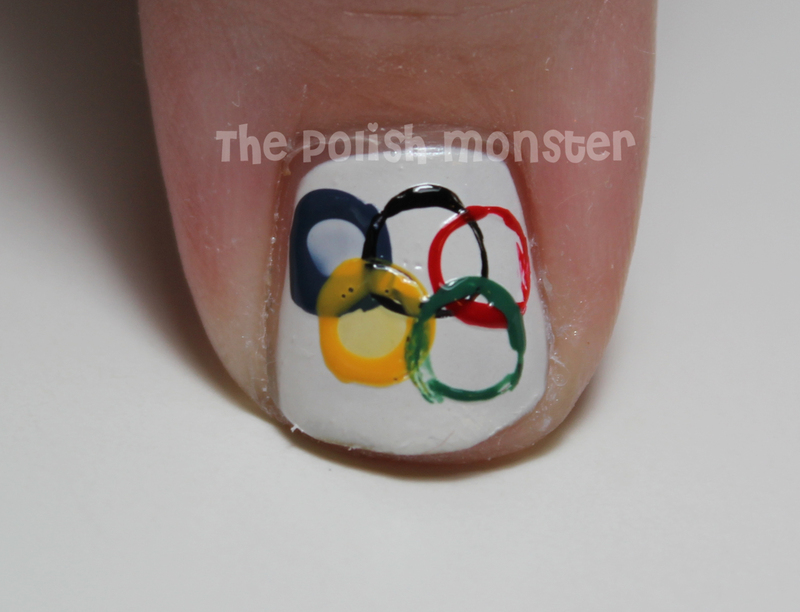 Now onto today’s post- Olympic Nails. Unless you’ve been living under a rock (which is always possible, I’m fairly in the dark with news a lot of times), you know that the Olympics began this weekend. Go Team USA! I had planned to use Pretty and Polished’s Freedom Calling, but I couldn’t find the bottle for the life of me. I know it’s around here somewhere. That is a good one to use though, it’s fairly similar to this one but not identical. Same idea- red, white and blue mixed glitter. 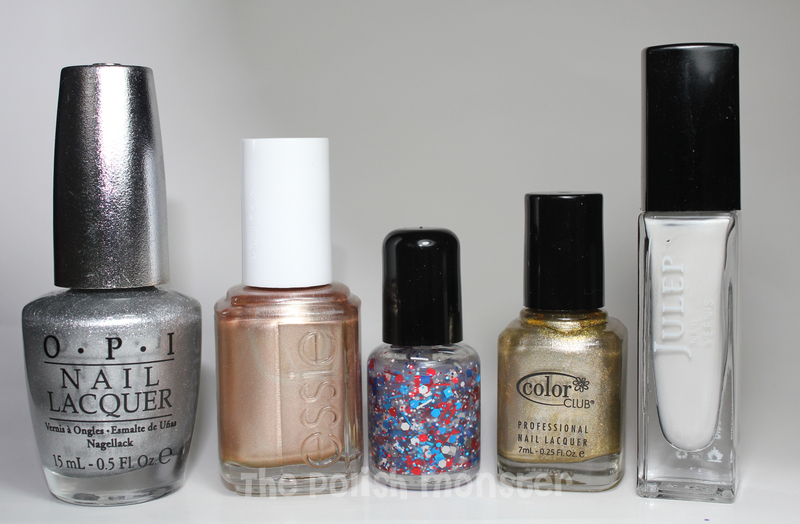 I think using all 3 colors from Essie’s Mirror Metallics would be good if you have them. This gold and silver did not play nicely when it came to cleanup, because of the glittery effect. You’ll need black, green, yellow, red, blue, and some straws (cutting them is up to you- but you’ll need 5 ‘sides’). 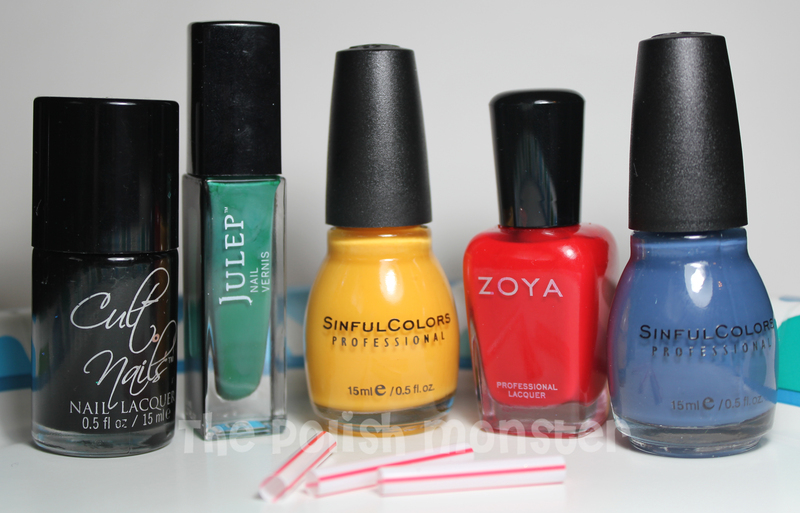 I used Cult Nails Nevermore, Julep Emilie, Sinful Colors Pull Over, Zoya Sooki, and Sinful Color’s Rain Storm. For cleaning purposes, I also used a paper plate, but a piece of paper will also work. Now we’re going to use these colors to create the Olympic rings on our thumb! To make the rings, I dipped the tip of the straw into a little blob of polish. If you don’t know off the top of your head (I didn’t), the rings go blue-black-red, and then yellow-green below them. So I began with blue, and worked my way down! Here’s the tip of the straw with polish on it. Then you’ll place the straw end where you want the first ring, and gently rock it around to ensure the polish gets on the nail around the entire circle. On my first circle, I lifted up after just placing it on my nail, and 1/2 the circle was missing. When I re-did it, it made it look a bit ‘off’. 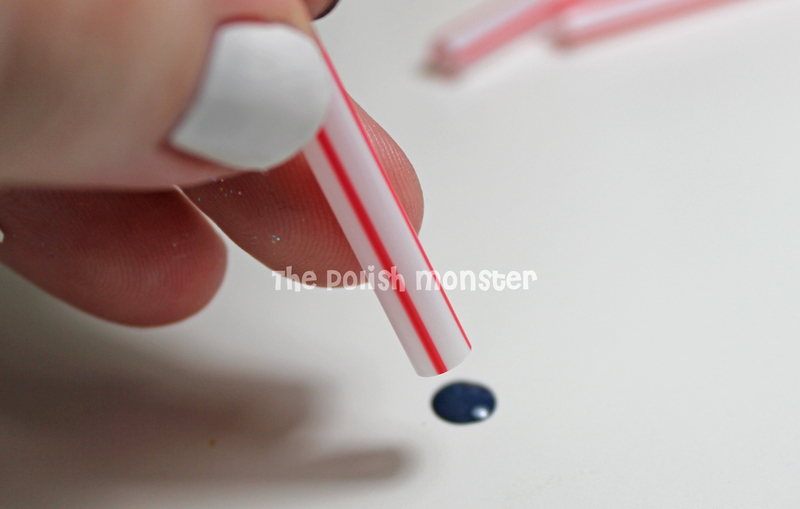 Do make sure you have a good bit of polish on the straw, but it doesn’t have to be dripping. My nails, in addition to being shorter, are not very big. I could *barely* fit the rings on my thumb, and they were all overlapping each other. If you have slightly smaller nails, I’d advise trying out a coffee stirrer straw instead of a standard one. If I had any, that’s what I would have used! My ghetto rings. At least it’s obvious what they’re supposed to be! I didn’t take photos of the next step (because my husband wasn’t home to help with pictures), but I wrote ‘USA’ in red and blue polish on my pinky. I did this using a paintbrush, but you could easily do it using nail art stripers, or maybe even a standard brush if you’re patient. 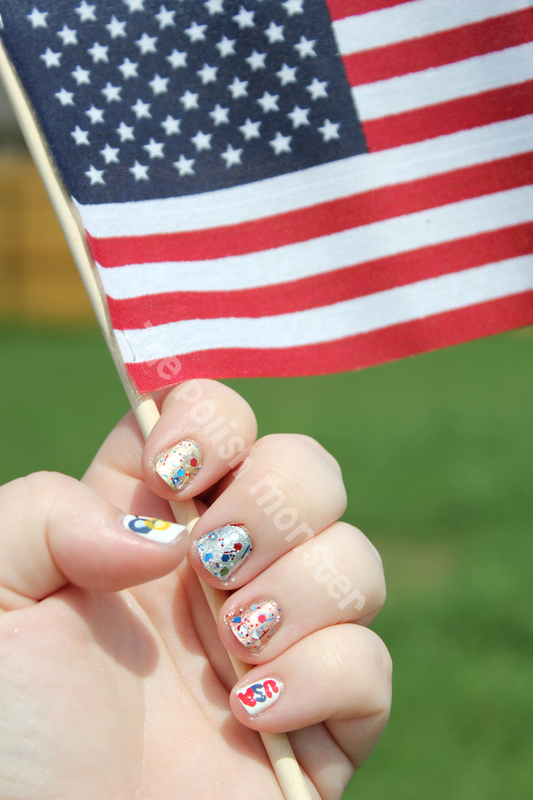 I then finished it all off with my red, white and blue topcoat over the gold, silver and bronze nails. Obviously, if you’re not from the USA, Britain, or another r/w/b country, you can use something else to represent your colors! Believe it or not, I DID clean up those metallic nails. The gold and silver really don’t like me! Go Team USA! Make us proud! 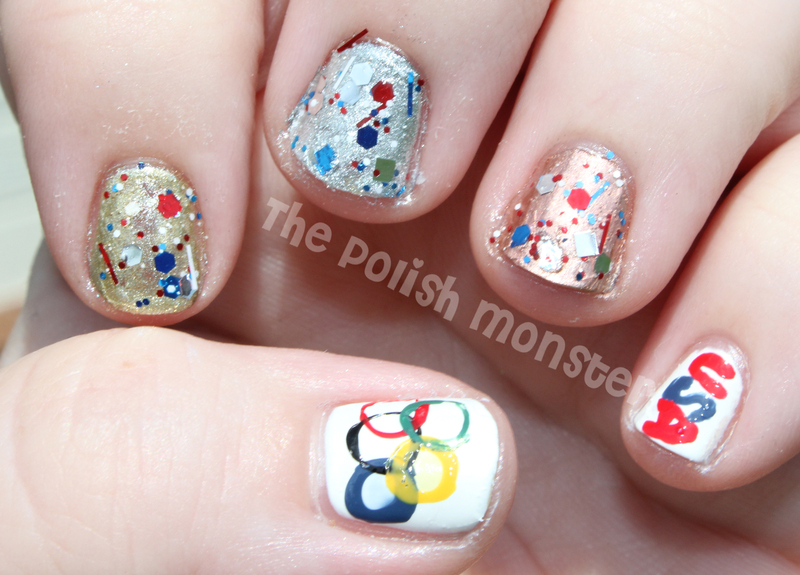 If you do any kind of Olympic mani, even if it’s completely different from this, please link up on my Facebook page- I’d love to see it and feature it! Good evening everyone! Today’s mani came out SO much better than I had hoped. I LOVE it! A good friend of mine has been asking about gradient nails for awhile. While I was very familiar with the basics, I had never actually attempted it before. So earlier today, I decided today’s post would be a perfect time to remedy that! In the past I’ve seen a number of amazing tutorials for how to do this, but I went on my own using knowledge I got from everywhere for today. I know there’s a number of pins floating around Pinterest of this technique. First off, the supplies! 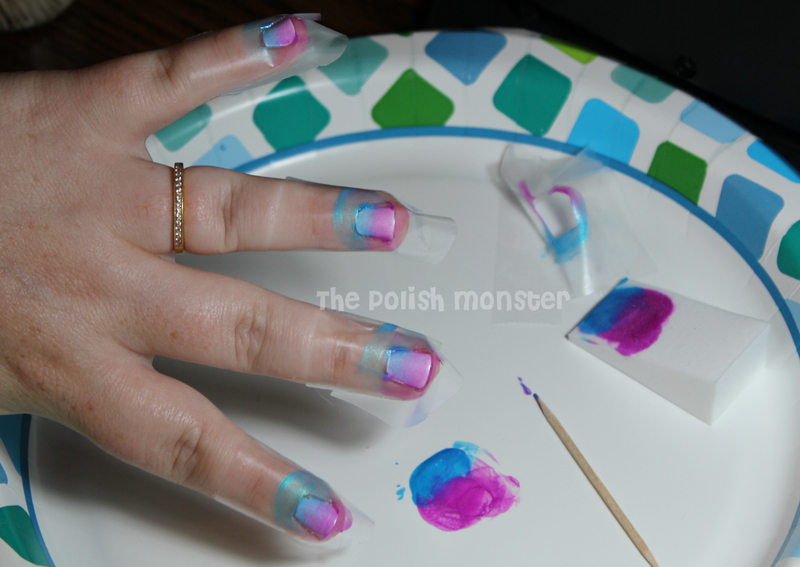 You’ll need tape, sponges, a white polish, the colors for your gradient, and a topcoat if you choose. I used Orly Dayglow, Sonnetarium Samurai Princess, Color Club Pure Energy, and Color Club Ultraviolet. The sponges are makeup sponges (cosmetic wedges) that I got in a giant pack at the dollar store. Anywho… on to the gradient part! I also advise taping all your nails first before painting. The colors I chose were not the most opaque, so I had to do multiple sponge coats for the gradient- it was easier to be able to do all 5, giving enough dry time between them for a second coat. I dropped a few drops of both colors next to each other on a paper plate, like so. The sponge is poised overhead to dab! You’ll press the sponge onto the paint, and then smoosh it onto your nail. I made sure the ‘line’ between both colors was roundabout in the middle of the nail. Voila! To be fair, though, this dark color was after 3 separate dabs. Here’s the other nails after 1 coat. And here’s a ‘finished’ picture, before I cleaned up. You can see the pulling on the middle finger from my tape. For those unfamiliar with cleaning up a mani- here’s what I do. I use a small paintbrush- it has a fairly small brush and is also moderately stiff (soft, but holds its shape while I use it). I dip the paintbrush into 100% pure acetone, and run it along the outsides of the nail and cuticle area, wiping off on a small tissue or pad. There’s lots of amazing tutorials out there if you need more help! If you need help finding one, let me know in the comments and I’ll find one. In my infinite wisdom, I didn’t take an ‘after’ photo of just the gradient. Whoops! But you guys get the idea 🙂 I just love where the 2 colors meet to form a blue-purple! So to make it more fun, I added my very favorite black and white glitter I own, Sonnetarium’s Samurai Princess. SO beautiful. I am seriously so upset to take this off- but it didn’t take very long to create, so I think it’ll make a re-appearance very soon! You can find Sonnetarium here on Etsy- she’s in vacation mode now, so you can find her Facebook profile here to stay up-to-date on restocks! Ultraviolet and Pure Energy were part of Color Club’s Electro Candy collection from 2009… you can still get these online, and I recently saw a set in Ross (for only $8!). See you all tomorrow for Try-It-On Tuesday! 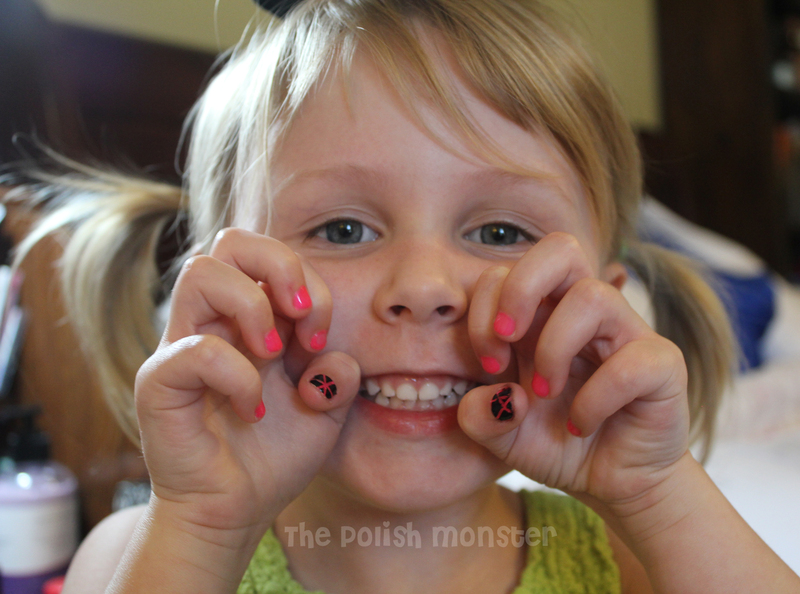 (Just Another) Mani Monday- Monster Nails! 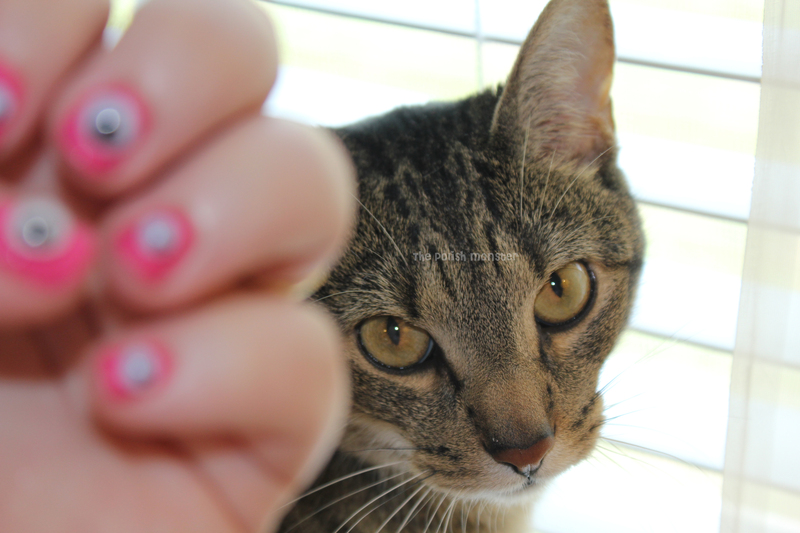 Today I have a fun look for Mani Monday! These are what I’ve dubbed… Monster Nails! You can get Flocking Powder in any craft store, it will be by the scrapbooking supplies. I think this container was maybe $2 on sale. I also grabbed a polish that was close to the color of the flocking powder (this powder I actually bought for crafts, not nails, so I worked with what I had), some clear top coat, and googley eyes! I picked Zoya Lara as my polish for this mani. It’s actually the first time I’ve worn Lara… and it look great on me! Cooler colors always work best with my skin tone. It’s a plain, pretty medium pink cream. 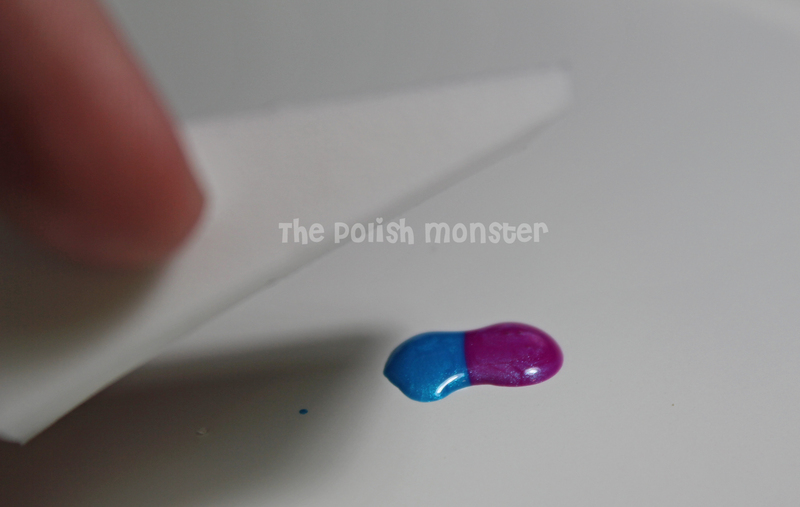 (15 minutes later) Sorry, took a writing break to stalk Dollish Polish over on Llarowe’s site. I was successful in my venture! Ok, so flocking powder! There’s 2 different ‘tops’, one to pour and one to ‘sprinkle’. I chose the sprinkling option, so my fuzziness was on the lighter side compared to many versions I’ve seen. Working 1 nail at a time, I simply put a coat of fast dry topcoat on, and sprinkled flocking powder until the nail was covered. This is a fun look 🙂 Because there wasn’t a ton on there, it wasn’t moving at all and there was no residual flaking. To do this, I just added a googly eye to each nail- that’s it! I dabbed it with a bit of nail polish, and placed it on. And they didn’t have the best of hold on there, though they weren’t falling off either. For more wear, I would probably opt for nail glue. My cat (Alex) thinks I’m crazy. And was also annoyed I was getting in his way of the sunshine. So there it is! A quick, easy fun look 🙂 This would be GREAT for Halloween! See everyone tomorrow- I’ll be featuring 2 new Essie’s for Try It On Tuesday!